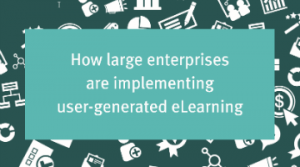 During the webinar both Danielle (Nielsen) and Kasper Spiro (Easygenerator) share how Employee Generated Learning is helping a large enterprise like Nielsen relieve the L&D department from an overload of learning requests. Nielsen managed to implement a new strategy to have employees fulfill knowledge requests themselves by adopting an Employee Generated Learning strategy. Danielle and Nielsen quickly got 400 employees to create learning content using Easygenerator. How Nielsen increased learning output with Employee Generated Learning. How to adopt Employee Generated Learning company-wide. The new role of the Instructional Designer and Learning Department. Why using a SaaS authoring tool is faster, cheaper and easier to maintain. QnA: Kasper and Danielle are happy to answer any question!